This is a 1994 American drama movie, directed by Frank Darabont. 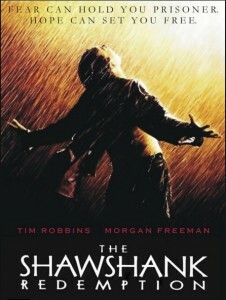 It was adapted after the novella “ Rita Hayworth and the Shawshank Redemption” written by Steven King. The story takes place in 1947 in Portland, Main. One of the main character, Andy Dufresne played by Tim Robbins is convicted for two life sentences for supposedly killing his wife and his lover. He is sent to the Shawshank State Penitentiary. Here he meets Elis” Red” Redding played by Morgan Freeman, also sentenced for life in prison for murdering his wife by cutting the brakes on her car, causing her to die in an accident, his motive being a large life insurance policy settlement. This is a story of two prisoners that bond over a number of year they spend in prison. 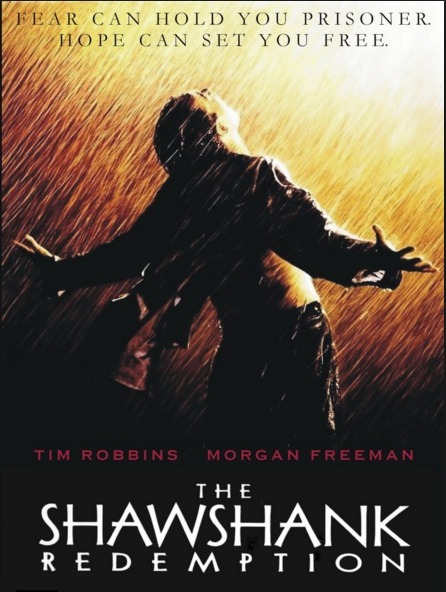 The Shawshank Redemption was nominated for Oscar 7 times for best picture, best actor in a leading role, best sound, best film editing, best music and best written screenplay based on material previously produced or published. In the Laundry where Andy works, he is assaulted frequently times by prison gangs. In 1949, Andy offers his help to the captain of the guards after he hears him complaining that he is taxed on an inheritance. He tells him that he can legally shelter his money wich the gard agrees on. Andy is moved to a new job in the prison’s library to help out an elderly inmate, after he is attacked and almost killed by on of the gangs. To protect Andy, Bogs, Andy’s atacher is sent to another penitentiary. His new jobs helps him to get closer to the prison’s employ and start managing financial matters for them. In 1954 Brooks, the elderly inmate that Andy was helping was released but he could not deal with the outside life after five decades in prison and hangs himself. After numerous letters written by Andy to the state government asking for funds to improve the library he finally receives a donation for the library, between them a recording of “ Le Nozze di Figaro”. He plays it over the prisons radio, fact that puts him in solitary confinement. In 1963 the prison’s warden starts to exploit the prisoners for public work. This way he gains money by underpaying for skilled labor and using the prisoners for different construction projects. That way he manages to offer a very competitive bid to large construction projects outbidding everyone on the market, Some of the companies his competing with are offering him a personal pay of just to stay out of their way. He is helped by Andy who is laundering money for him using an alias. In 1965 a mew inmate, Tommy Williams ends up at Shawshank prison for burglary. After Andy is helping him with his studies and he manages to ged his GED, Tommy tells Andy that a prisoner at another penitentiary pleas guilty for the murder that Andy was convicted for. After a few attempt to bring this information to the wardens knowledge he is ignored and more that that he is sent to solitary confinement. Norton also orders Tommy’s execution under the pretext that he tried to escape. Andy is kept in solitary for 2 months because he refuses to continue laundering the money for Norton, but he gives up after the warden frightens him with burning down the library, removing Andy’s protection and putting him in the yard into the worst conditions. After andy get out from solitary confinement he tells Red about his dream to like in Mexico. Although Redd tells him he is unrealistic but he promises Andy that he will visit a specific field in Buxton, Maine where Andy buried a package. In the last 17 years spent at the Shawshank penitentiary, Andy was digging a tunnel from his cell with the rock hammer procured by Red years before. He realized that the walls of the prison were made of low quality, improperly mixed materials, probably in order to save money.When he realizes that he can chisel through with a small rock nothing will stop him to gain his freedom. The tunnel was covered by a big poster of Rita Hayworth also given him by Red. He finally puts his plan to escape in action the next day after he tells Red about his dream. He escapes to the tunnel and the prisons sewage pipe. When the guard can’t find him in his cell at the roll call, Norton irritated throws a rock in the poster hanging on the wall of Rita Hayworth, but the rock tears through the poster and the warden discovers the tunnel. After he escapes, he poses in Randall Stephens the alias that was laundering money for Norton and goes to the several banks dressed in the suit and shoes that he took from Norton when he escaped and withdraws the laundered money. After withdrawing all the money, he mails the proof of laundering and evidence of corruption and murder to a local newspaper. Norton kills himself to avoid being arrested when the police arrives to the penitentiary. After serving 4 decades in prison, Red, Andy’s friend is released. He also has a hard time to adapt to the outside life, but he remembers the promise he made to Andy. He visits the place in Buxton, Maine where Andy told him he will find a package and he find the money and a letter from Andy that’s telling him to go to the coastal city in Mexico they were talking about last time. Red violates his parole and crosses the border to Mexico to meet his friend. He admits he feels excitement and hope for the first time when he meets his friend. The final scene where Red walk up the beach to meet Andy is full of emotions as both know they are now free to live their lives outside the cruel and domineering rules of Shawshank Penitentiary and the warden. They are no longer the prisoners of society and the wardens slaves. Federal income tax was due in 1949’s om March 15 and not April 15 like today. Also the name of the IRS was changed in 1950’s. Before 1950 they were called Bureau of Internal Revenue. The big size poster Andy is using to cover the tunnel he is digging is first printed in 1960. It was not available in 1949. The car Andy is driving after he escapes is a 1969 GTO while he escaped in 1966. There are so many more, but even with these obvious goofs the movie is still a good movie being voted with over one and a half million of users of the IMDB website.